NITROGEN is a chemical element with symbol N and atomic number 7. It is the lightest pnictogen and at room temperature, it is a transparent, odorless diatomic gas. Nitrogen is a common element in the universe, estimated at about seventh in total abundance in the Milky Way and the Solar System. On Earth, the element forms about 78% of Earth’s atmosphere and as such is the most abundant uncombined element. 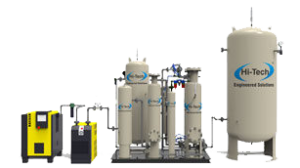 PSA Oxygen Plant use pressures swing absorption method for separating nitrogen from air.the system operates over ambient temperature with working pressure up to 415 bars(G). A cryogenic plant uses fractional distillation of liquid air technique to separate Oxygen and Nitrogen due to their boiling point difference. 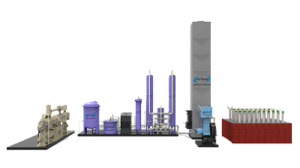 The Oxygen and Nitrogen thus obtained is directly filled to a cylinder with the help of Separate pumps.